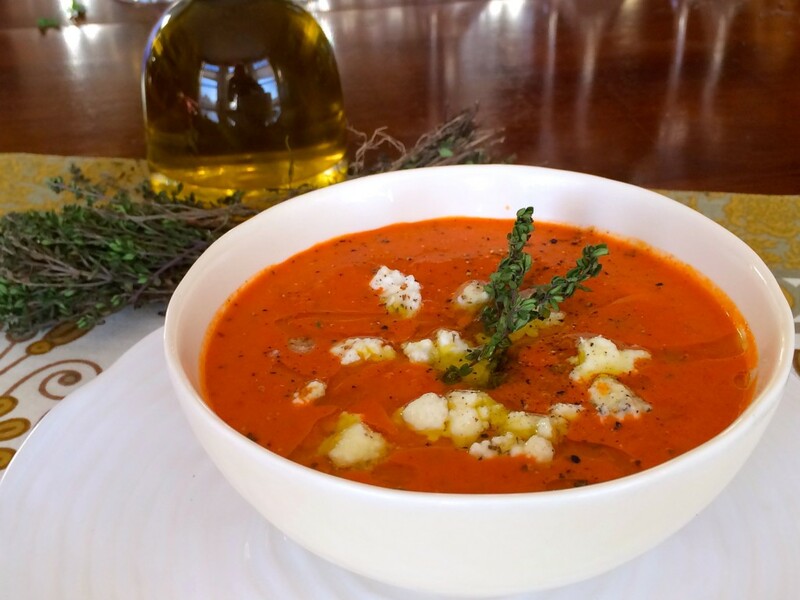 Nothing beats creamy tomato soup, and adding roasted red peppers is a fun take on the traditional recipe that will make you smile. For the past several weeks now I’ve been traveling around the world showcasing some incredibly tasty—and spicy!—cuisine, from Vietnam to the Middle East, Thailand to Mexico. Today I’m returning to a dish that is more familiar to most. 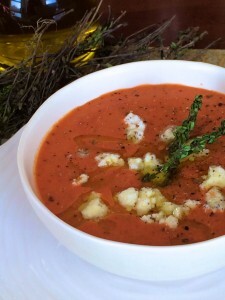 It’s a Mediterranean take on a classic American favorite, cream of tomato soup. It has many fewer ingredients and steps than recipes I’ve recently created, which is important because not everyone is interested in chopping tons of vegetables and searching the stores for exotic spices. And I feel exactly that way sometimes, too. Enter today’s soul-warming soup. It’s the perfect dish to bring us closer to traditional home comforts and ideal for simple weekday meals. 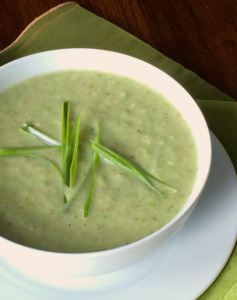 You just need a few familiar veggies and common items you’ve likely got hanging around your home and you’re twenty-five minutes away from a creamy, rich, gorgeously-hued soup appearing on your supper table. Heat oil over medium heat. Add the onion, season with salt and pepper, and sauté until translucent, about 6 minutes. Stir in garlic and spices until fragrant, about 45 seconds, then add in the roasted red peppers and tomatoes. (Roast a pepper using one of the methods here or just use a high-quality jarred product form the store.) Cook 5 minutes over low heat to bring the flavors together, then add the stock and bring up to a boil. 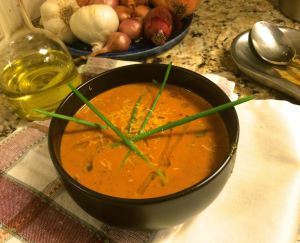 Simmer for 10 minutes, then use a hand blender to purée the soup until smooth. Stir in fresh thyme and cream and simmer an additional 5 minutes. Taste and reseason with salt and pepper as desired. 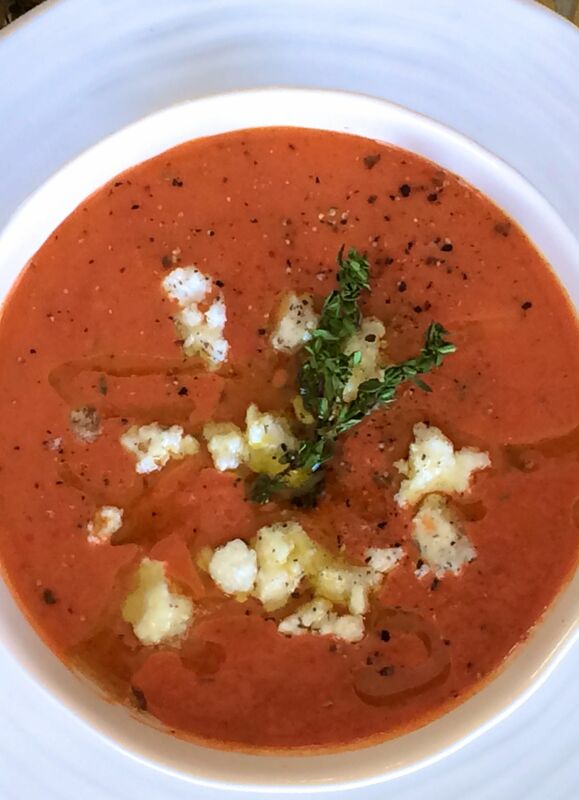 The soup is terrific on its own, or you can garnish with a crumble of chèvre, more fresh pepper, and a drizzle of olive oil for extra-special treatment. And it’s as wonderful as it looks. And if you like this, then you’ll definitely like my basic cream of tomato soup, which is even easier and starts from either canned tomatoes, fresh tomatoes, or even leftover tomato sauce—your choice! And there’s a cooking video showing you how-to here. No excuse at all not to get this simply delicious dish into your repertoire. Reblogged this on Mediterranean Diet Food. 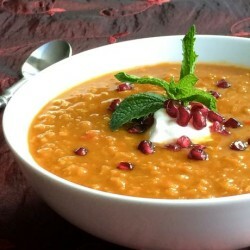 I tried your red lental soup recipe when I bought a national geographic magazine about super foods and have made it several times. Everyone I’ve shared this one with loves it. Thanks very much. Many thanks, Rod! Here’s to your health!